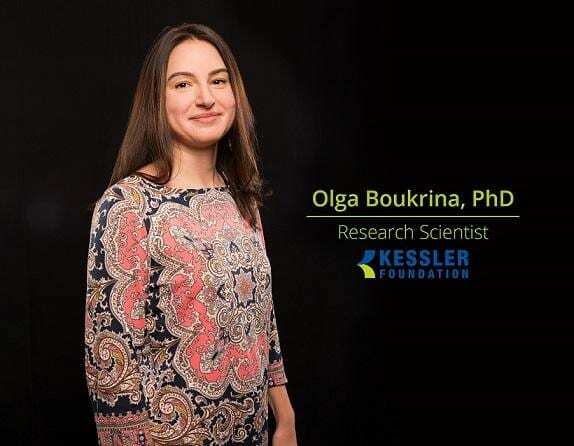 Olga Boukrina, PhD, research scientist in Stroke Rehabilitation Research at Kessler Foundation, has received a $10,000 grant from the Mabel H. Flory Charitable Trust. The grant funds Dr. Boukrina's continued research on the role of reading deficits as a barrier to aphasia rehabilitation. This is the sixth year the Flory Charitable Trust has awarded Kessler Foundation this grant for research on aphasia after stroke. Reading deficits are common after stroke and represent a significant handicap, often preventing individuals from returning to work, school, and the community. Despite the impact reading deficits have on daily living, few studies have explored the nature of reading deficits and their association with brain damage from stroke. Early identification of reading deficits is fundamental to effective intervention. Through this research, investigators aim to develop benchmarks for identifying high-risk patients using neuroimaging brain scans. "This award from the Flory Charitable Trust has enabled us to identify areas of brain damage that are associated with impairments of specific skills necessary for reading," said Dr. Boukrina. "We've also been able to categorize patients by type of reading difficulty, such as whether the deficit is founded in word appearance, word meaning, or word sounds," Dr. Boukrina noted. "With the use of neuroimaging, we have confirmed that the left-hemisphere brain regions known to support typical reading also enable recovery from reading deficits provided that these regions are spared by stroke. This finding provides the foundation for the development of effective treatments for stroke survivors with aphasia and reading deficits." Research studies span all domains of post-stroke dysfunction, including cognitive deficits and mobility impairment. Under the direction of A.M. Barrett, MD, stroke scientists also mentor students, resident physicians, and post-doctoral trainees in translational neuroscience of rehabilitation. Cognitive research emphasizes hidden disabilities after stroke, including disabilities of functional vision (spatial bias and spatial neglect) and reading deficits. Mobility research, in partnership with Human Performance & Engineering Research, centers on the application of robotic exoskeletons for stroke rehabilitation. Stroke research receives funding from the National Institute on Disability Independent Living and Rehabilitation Research, Department of Defense; the National Institutes of Health/NICHD/NCMRR; New Jersey Commission on Brain Injury Research, Mabel H. Flory Charitable Trust; the Healthcare Foundation of New Jersey; the Wallerstein Foundation for Geriatric Improvement; and Kessler Foundation. Scientists have faculty appointments at Rutgers New Jersey Medical School.